Hilariously, Oskar was fast asleep exhausted by his brilliant effort on the climb so far. 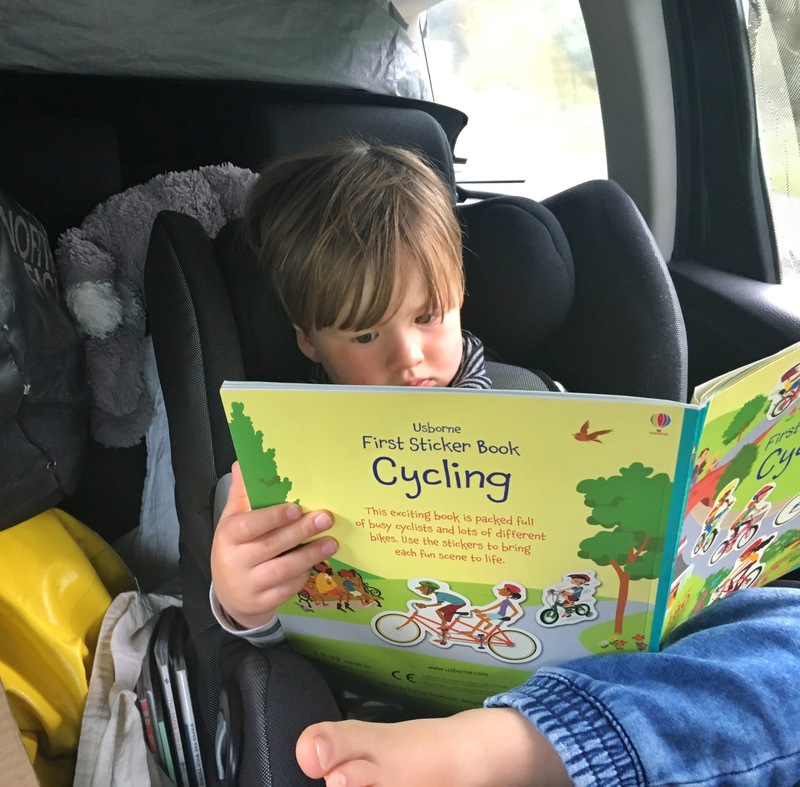 He was snuggled up in his little backpack on Morten’s back and cuddled in behind Morten’s neck, with his hat on, hood up, waterproofs on and buff pulled up over his face – as far as he was concerned he was snuggled up in a warm little bed. And then he woke up. Loudly. Morts and I took one look at each other “Head down?” “Yep. Go now. Quickly”. Poor Oskar was not happy and understandably was not a fan of the weather conditions, shouting “make it stop!” and sort of wailing. I must admit – at this point we felt like pretty bad parents. We descended as quickly as we could, passing people who were still battling the elements and on the way up. After 30 minutes we made it to the Half Way House: the windows were all steamed up but we could see it was rammed with multi-coloured soggy people, taking refuge as the rain teemed down. The moment we were inside, Oskar was fine. 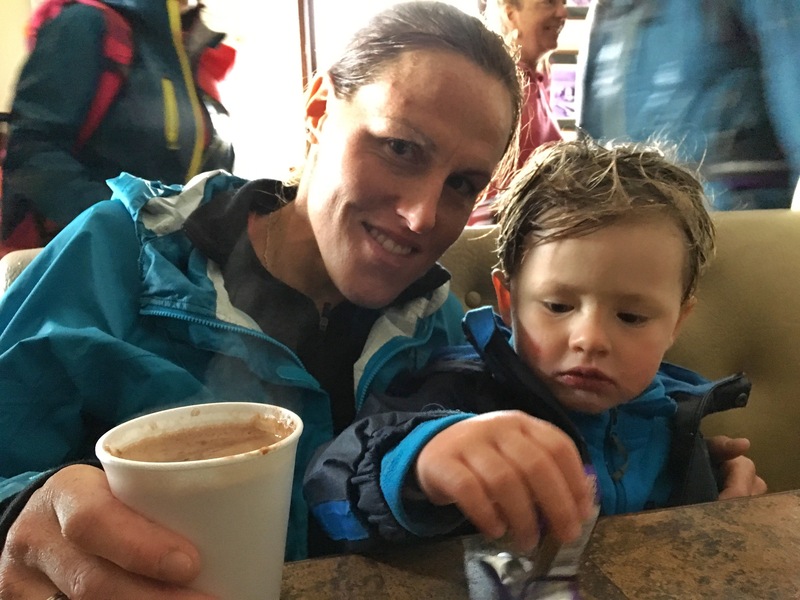 And with the promise of a usually prohibited hot chocolate and some chocolate brownie Oskar suddenly looked as happy as if he was sitting on a John Deere tractor. Everyone was making a fuss of him as he was clearly the youngest person on the mountain by a mile. After a quick warm up and re-fuel and with smiles back in residence, we continued to descend the remaining 2.5 miles back to Llanberis. And so Oskar’s first summit attempt was foiled. 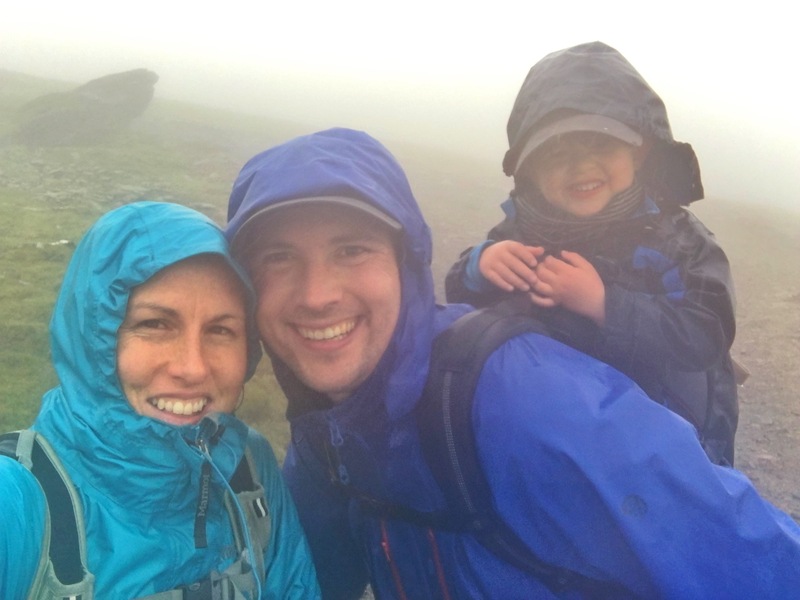 He had not ‘bagged his first peak’ but we had all learnt a lot about how he coped with such hikes and had also been reminded about how changeable the conditions can be on the mountain. It had been bright blue skies when we left but within hours, and at a higher altitude it had clearly been a very different story. You must ALWAYS pack for the worst (and check weather conditions before you go!) and Snowdon should never be under-estimated! Mount Snowdon is the highest mountain in Wales, with its peak at 1085m. Allegedly Sir Edmund Hilary trained on Mount Snowdon for his 1953 ascent of Mount Everest, so it definitely presents some challenges! 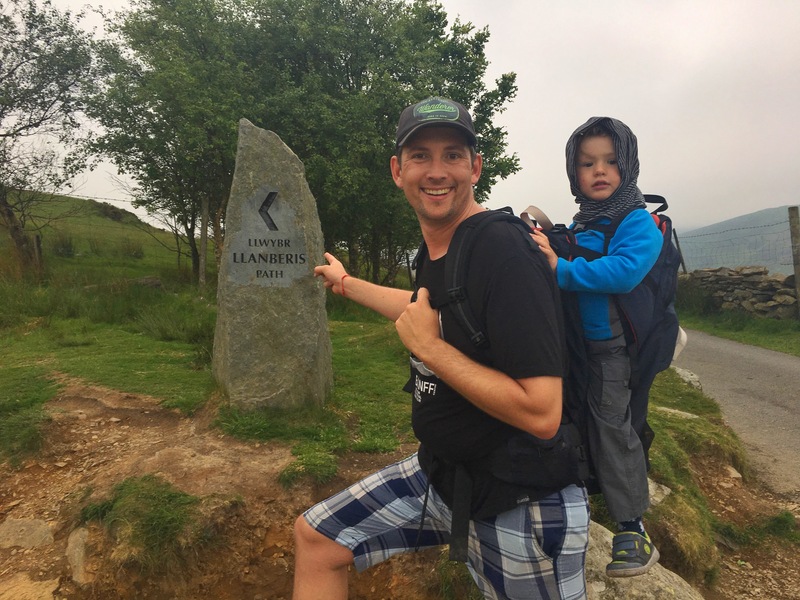 There are six different routes up Snowdon of various difficulty levels, but we’d headed up the Llanberis Path – the “easiest but never easy” route. 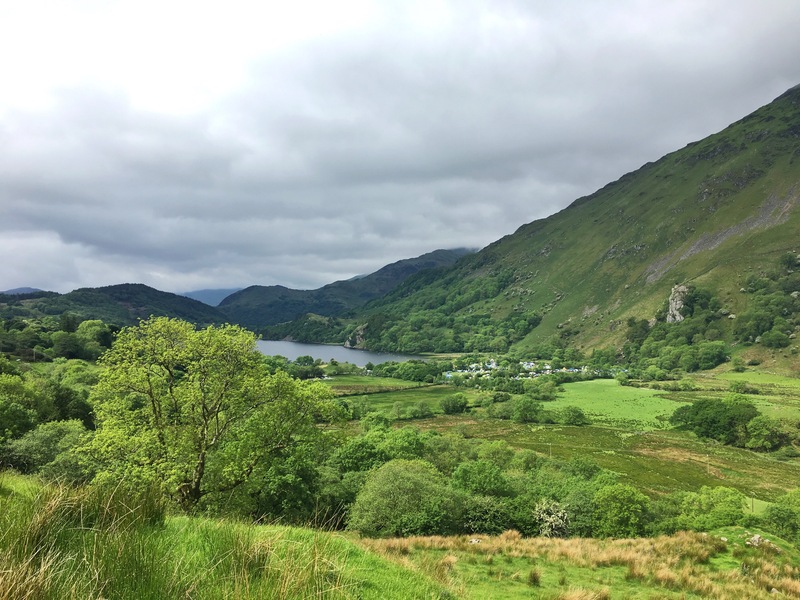 The problem with the Llanberis path, often referred to as the ‘tourist trail’ is that people massively under-estimate it and assume it’s just an easy walk. It is not! 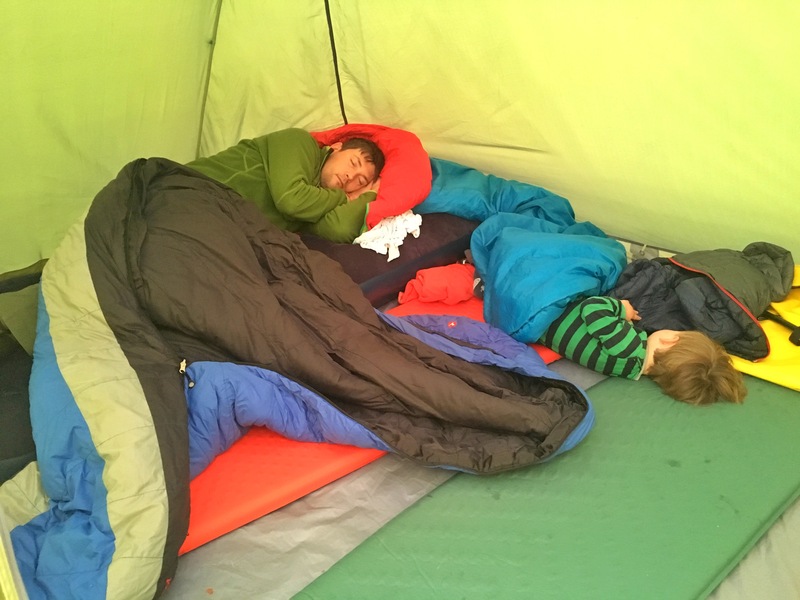 We saw many people woefully ill-equipped to take on the challenge, walking up in shorts and t-shirts, some in heels and pumps, and carrying no additional kit. 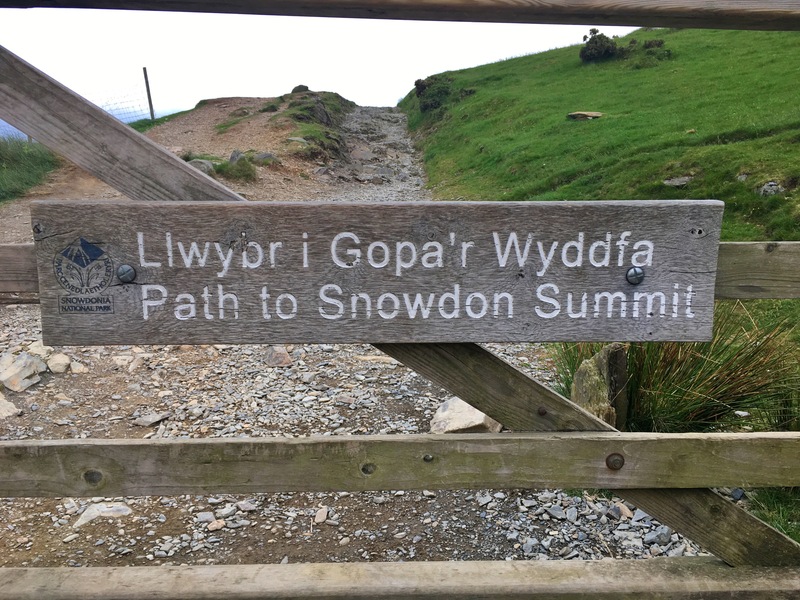 The path is a 9 mile round trip, with 975 metres of ascent (and therefore descent!). 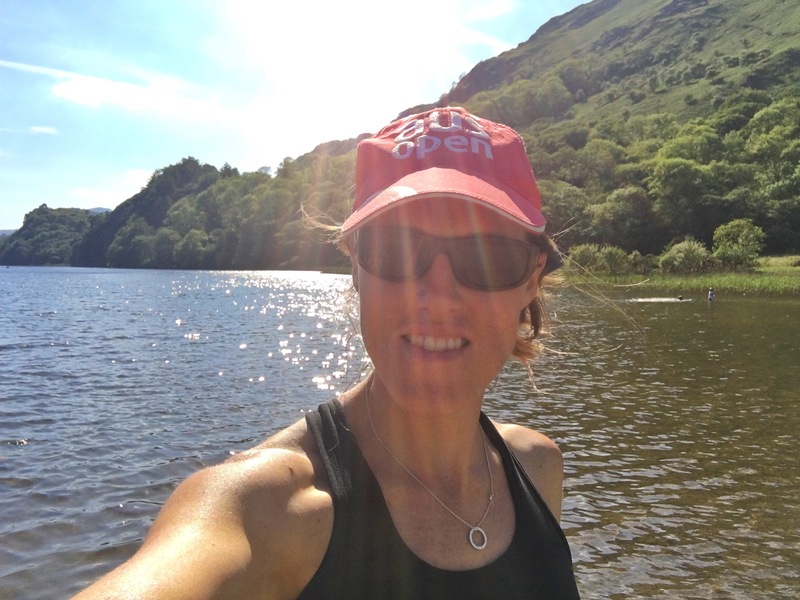 It is a long plod, with tricky undulating terrain, but as shown today, it is the weather conditions that can take the hike to a whole other level. 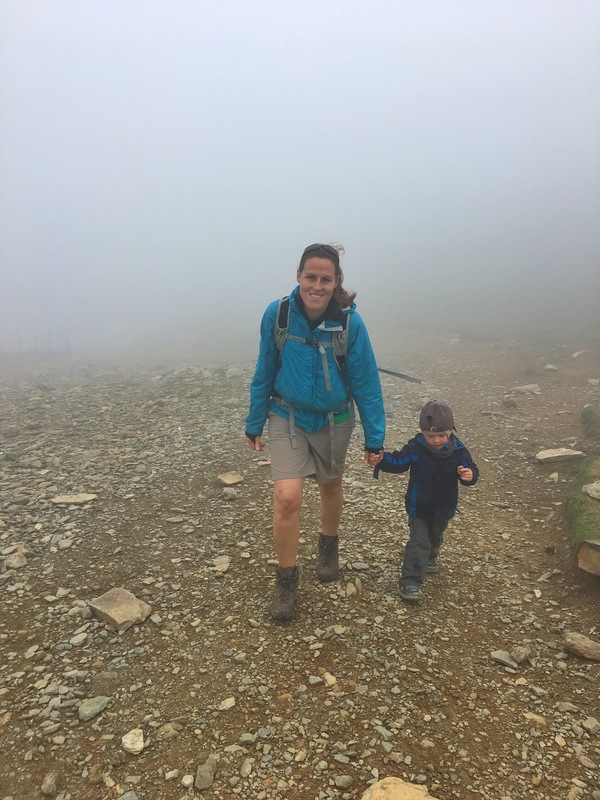 If you are planning a trip up Snowdon then there is some great information on the ‘Visit Snowdnia’ website, which we highly recommend checking out before you go. 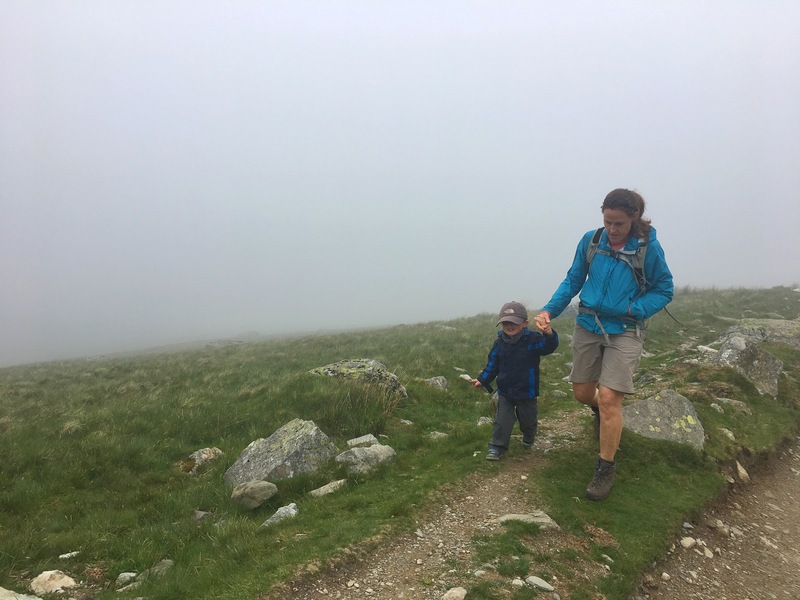 It was a great path for Oskar though – clearly being just 3 years old, the intention was never that he would walk the whole way. But he was happy plodding a long way up, and was also pretty content in the backpack, although weighing in at 17kg it’s pretty tough on the carrier! My knees were certainly throbbing after carrying him down the mountain! 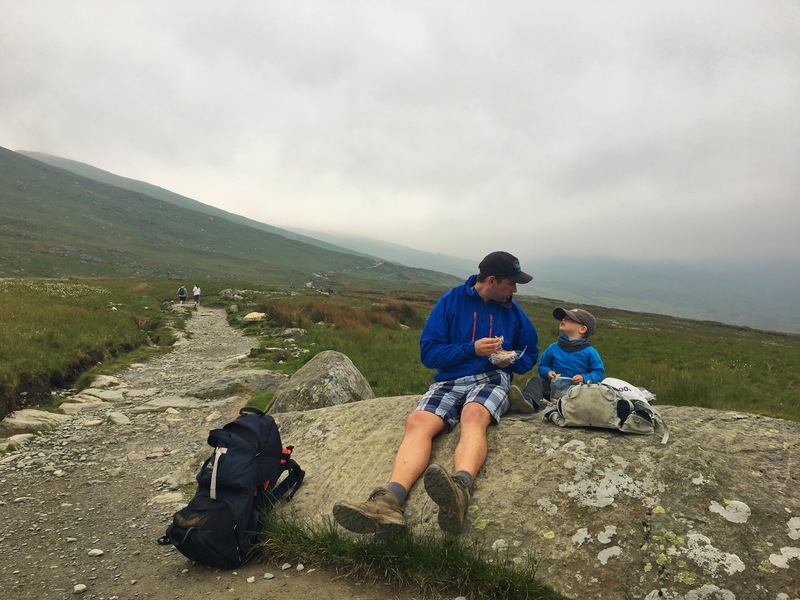 Other necessities for toddler hikes are endless snacks (preferably new ones that they are not yet bored of! ), lots of song-singing, lots of regular stops, and a thermos of warm milk (Oskar’s fave). 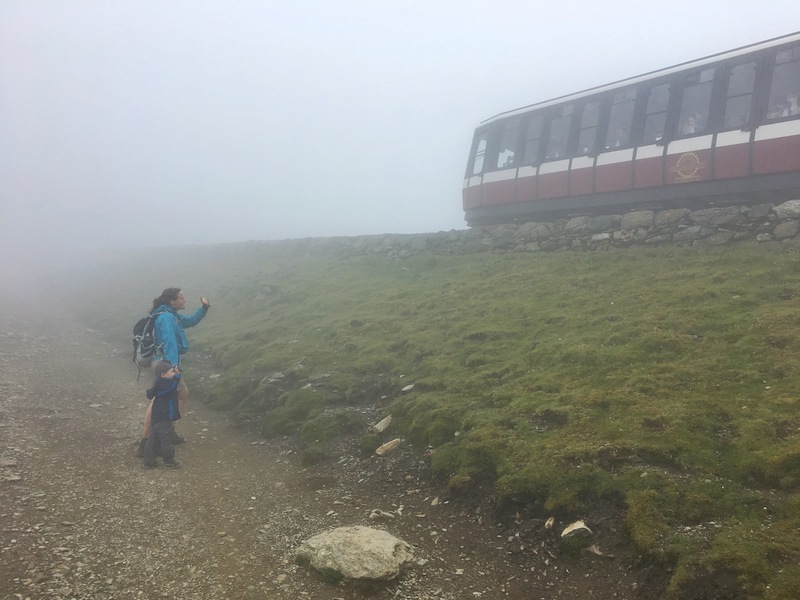 On this particular trip, another brilliant amusement was the mountain railway that ascends all the way to the summit of Snowdon.We spent a lot of time listening for it, watching it, trying to find it in the mist and once located, waving at passengers, all of which Oskar loved. 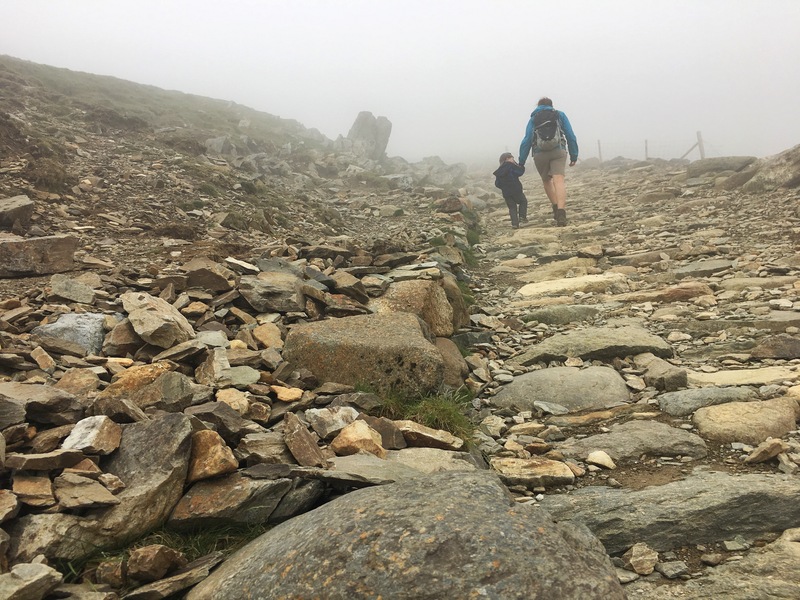 If you fancy heading to the summit of Snowdon but do not fancy the walk, or if your little ones are just too little, then the Mountain Railway would be a great option. You can choose to take a diesel or a steam train as both make the trip, but whatever you choose, be sure to book in advance as often it’s fully booked, meaning tickets are not available on the day. 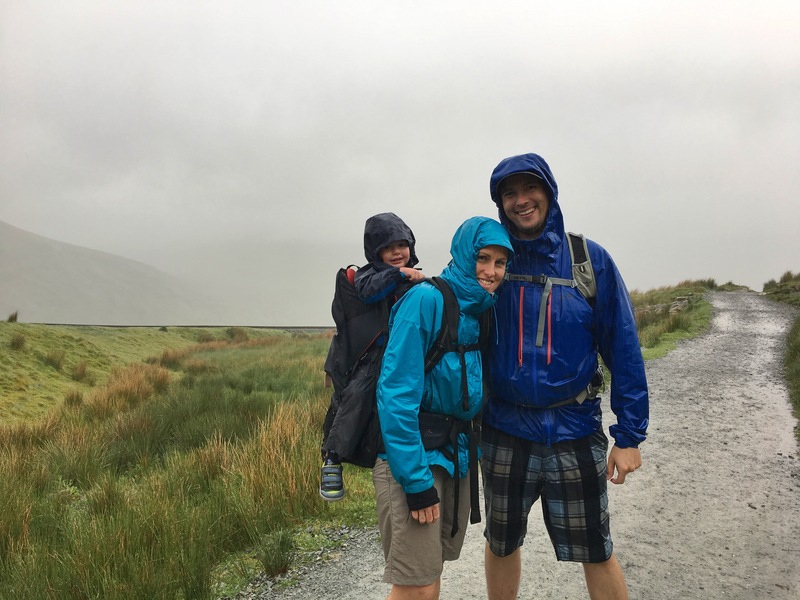 As well as our Snowdon attempt we enjoyed some more relaxed and somewhat drier (!) days, just chilling out around camp. 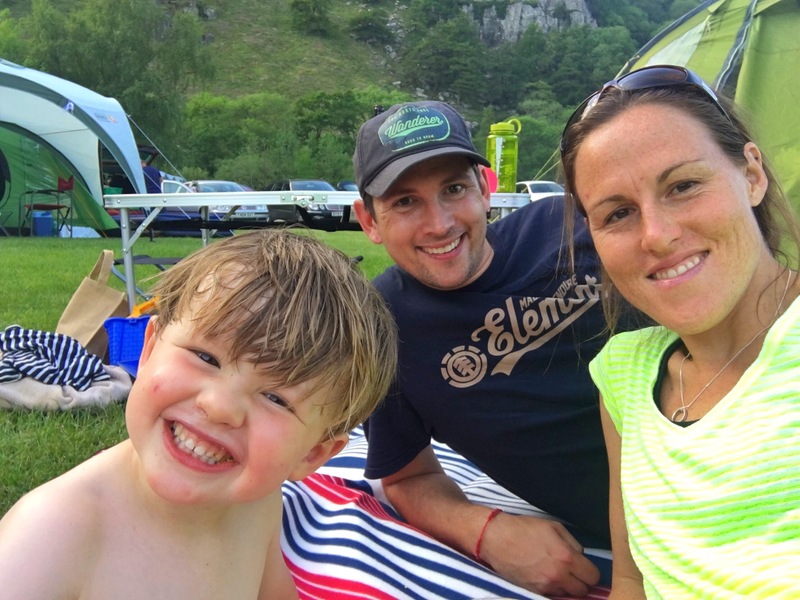 We stayed at Llyn Gwyant Campsite – a large site positioned in the most stunning of settings, right on Llyn Gwyant lake, with Snowdon as a backdrop. We’d never stayed here before but it had been recommended by a friend. 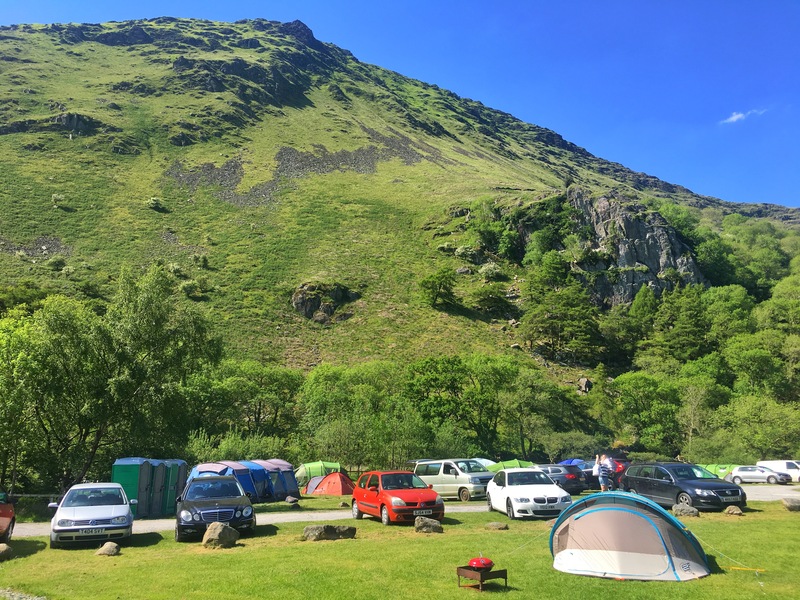 We did really like it in terms of its setting, but it was just far too big for us….. it was the May Bank Holiday weekend and there were over 1000 people staying on the site and it just felt like a bit of a car park. Furthermore, the facilities were woefully inadequate for these sorts of numbers, with one small toilet block and only 6 showers!! That being said, despite these numbers, it was really quiet in the evenings as this is something they are very strict about managing and there was generally a nice atmosphere, with loads of campfires and lots of chat. We met some great people that we’d stayed up late chatting to, sharing stories and adventurous tales and laughing along to Ivan the Russian who appeared from his stories to be a computer-programming trained assassin who liked rock climbing. So, if you don’t mind a big crowd then definitely stay at Llwn Gwyant as it’s location location location, but if like us you prefer a quieter and more relaxed affair then I’d probably stay clear. 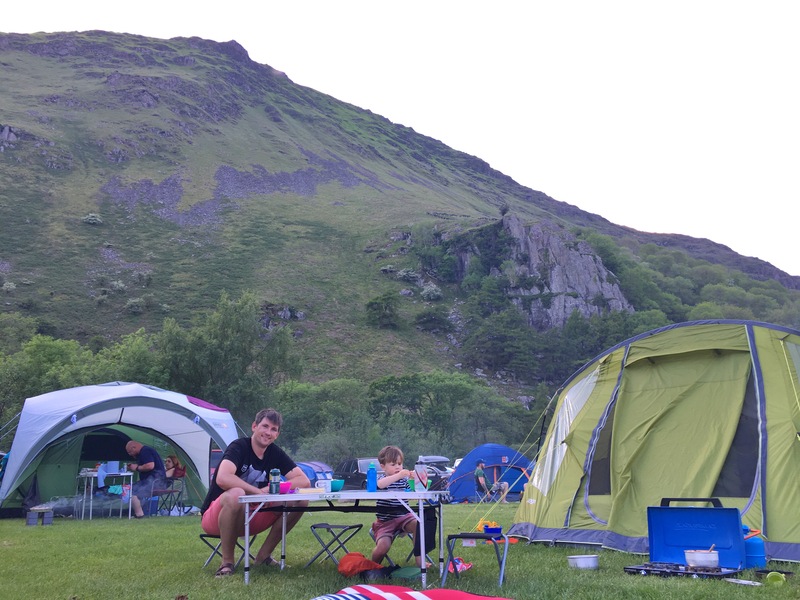 There’s loads of other smaller, more basic campsites in the area that would also be able to boast a stunning setting. 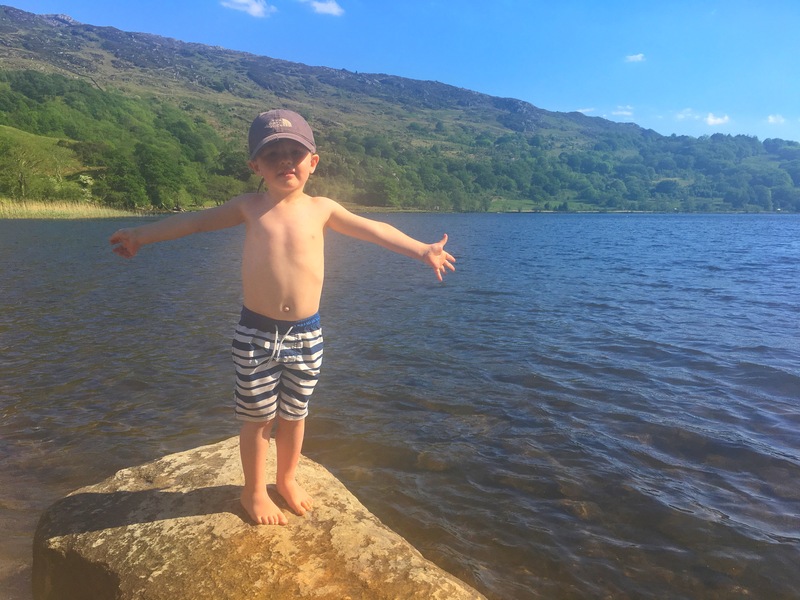 We did make the most of being on the lake and had some absolutely spectacular weather for the first day that we were there, where we all got in the water! It was scorching! In fact, most days started with gloriously blue sunny skies, before morphing into an overcast sky, a bit of drizzle, a brighter afternoon and then a torrential downpour overnight, only to wake up to bright sunny skies again. 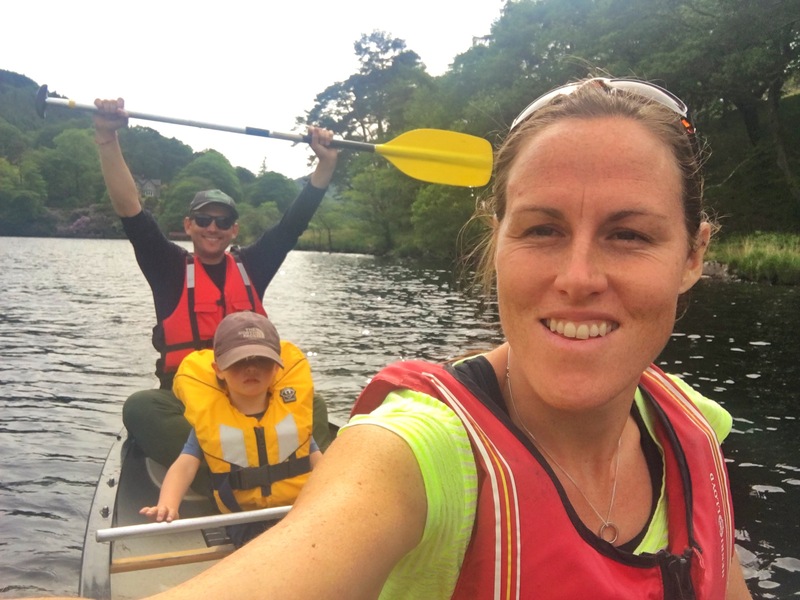 We had a great afternoon canoeing on the lake on the Sunday, which we thoroughly enjoyed. We hired the canoe from the base on camp and paddled to the far end of the lake and investigated some beautiful houses and gardens before heading back to the bottom of the lake and up the river a little. You can also rent paddle boards and kayaks and it’s a good 1-2 hours well spent. 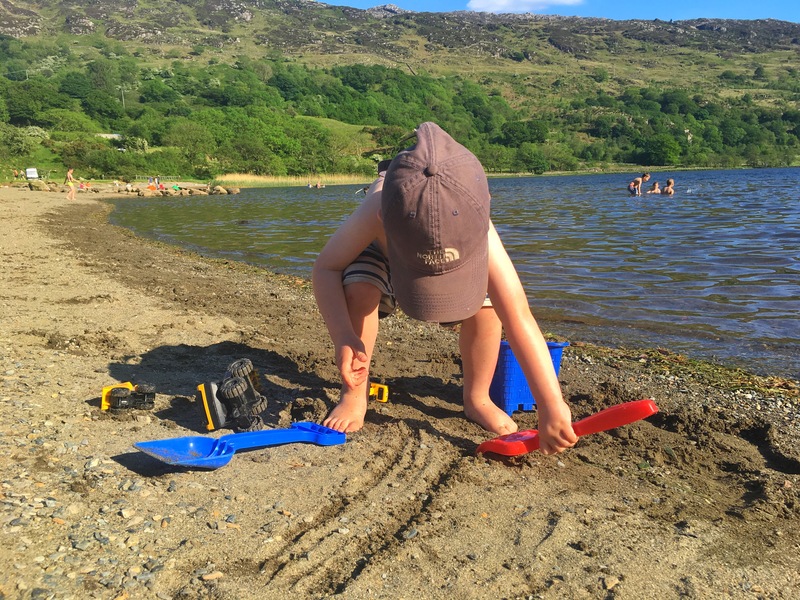 The lake is perfect for kids as it’s so shallow, but remember those water shoes as it’s pretty rough and rocky! The kids all loved it though and there were loads of them swimming and playing in the water, fishing with little nets, clambering over the rocks, digging with buckets and spades and of course throwing stones into the water. There’s a small sandy beach of sorts and it was amazing to have the weather to be able to enjoy it all as I don’t think we expected to be taking a dip in the water in May! 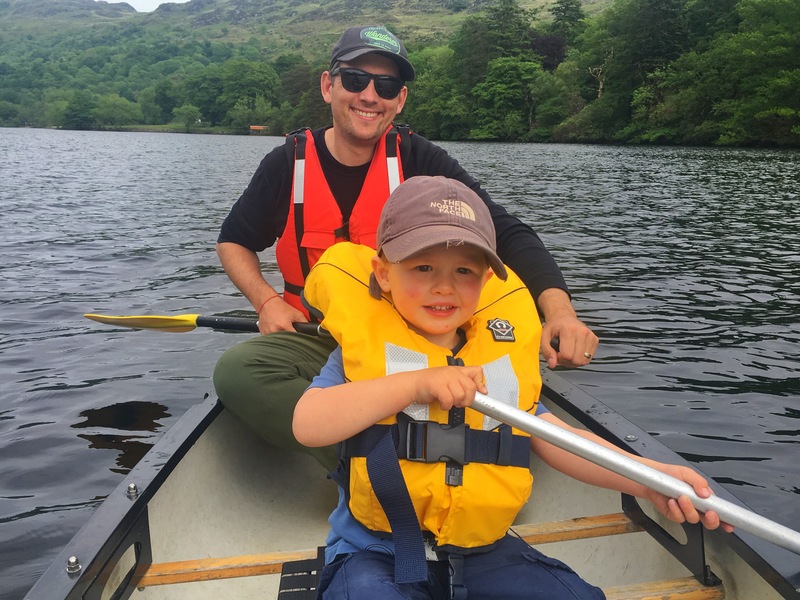 It’s also worth heading to the lake in Llanberis where there is a nice walk, an adventure playground and another steam train that runs along the lake (an hour return trip). You can also hire canoes/kayaks and SUP boards there, which many people were doing. We also had a poke around Bedgelert, which is a super-cute little village and is a place that Morts and I have lots of fond memories of, from camping trips past. All in all, come rain or shine there is plenty to do and see in the area. It is such a stunning area to explore, with long winding roads through beautiful valleys, endless stone walls dissecting the landscape and sheep dotted everywhere. You can’t help but feel relaxed at the slow pace of life. Our final morning was dry but the grey clouds were brewing so it was clear that rain was imminent. 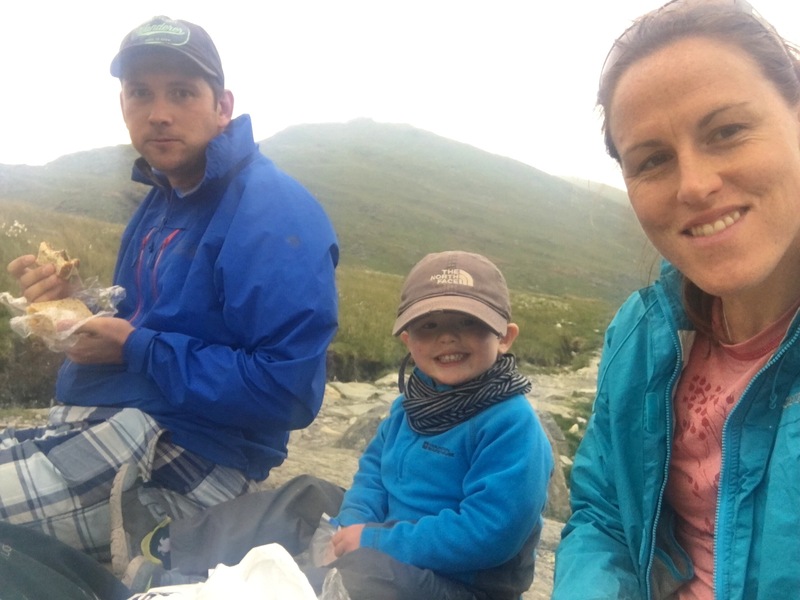 With this in mind, we opted for a quick pack up rather than doing brekkie, and instead headed back to Llanberis for one last time to go to the renowned ‘Pete’s Eats’ – a multi-coloured ‘caff’ that is a local institution. 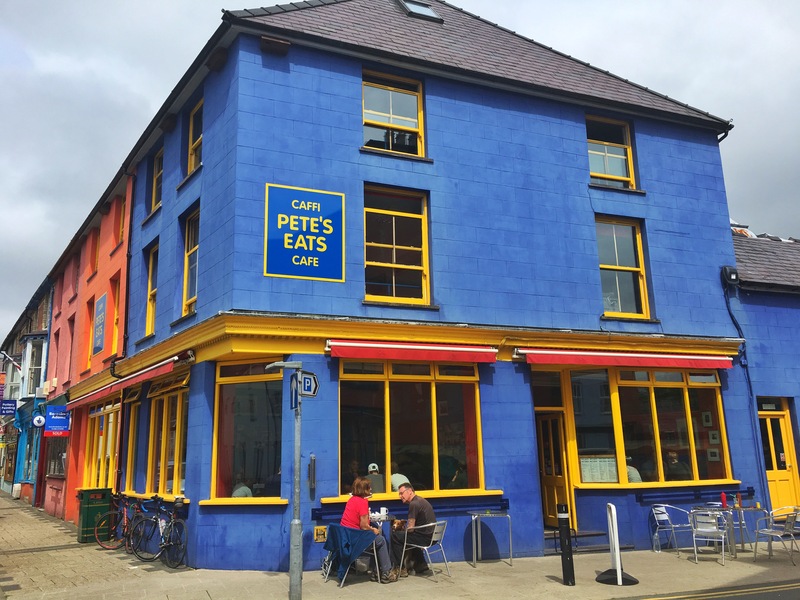 Pete’s Eats has been in action for nearly 40 years and specialises in enormous fry ups and gigantic mugs of tea and coffee and churns them out thick and fast. Morts and I remembered having been here multiple times before on various trips so wanted to head back for ‘old times sake’. I must admit, the brekkie was alright but pretty cheap ingredients, and you had to queue for ages (as in over 20 minutes) to place your order. As one bloke in the queue described it: “it’s been consistently average for over 30 years”. That being said, it’s cheap as chips, warm, colourful and cheerful and the portions are massive, so if you’ve just got off the mountain and are starving, it’s a great option. They also do big burgers, Jacket Potatoes, Chilli, Lasagne and other such hearty dishes. It’s not trying to be something it is not and it definitely serves a purpose. With full tummies we leapt in the car and started the long drive home. 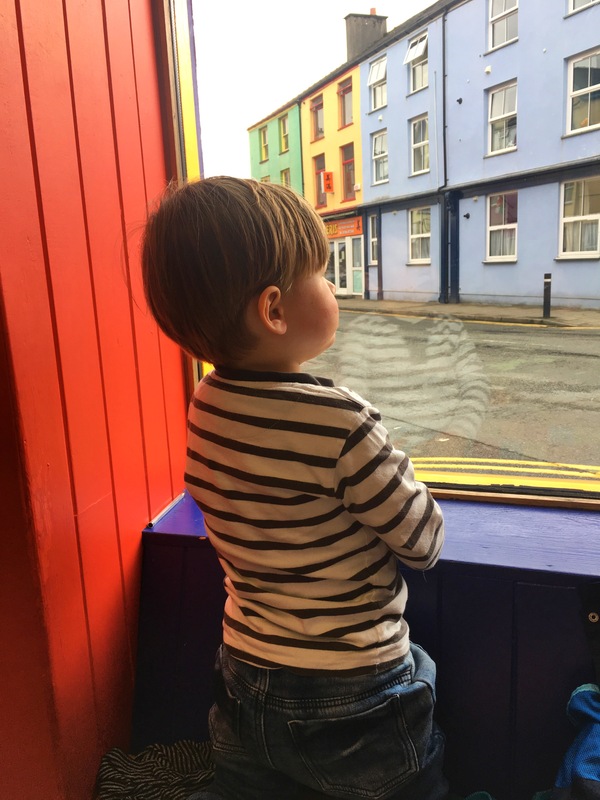 North Wales is a great place to take kids and we will definitely be back when we have 4+ days to play with (any less and it will just be too far to travel). 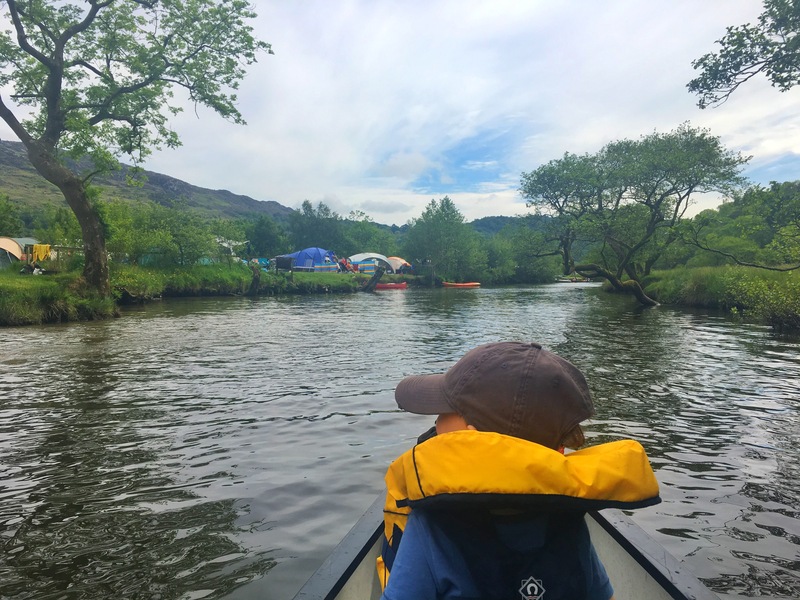 We’d experienced everything the weather could possibly throw at us from scorching sun to torrential downpours, we’d met some great people, had some wonderful outdoors experiences canoeing and hiking, and as always enjoyed our camping and family time. Thanks Wales and see you again soon! Good night! Still you’re all still smiling.